Functional and beautiful, stainless steel is great but is it for everyone? Stainless steel is an amazing decoration. It’s sleek and elegant, and can make your budget refrigerator glimmer like it cost more than a couple grand. Many of us enjoy the look of stainless steel throughout the house, especially in the kitchen. However, it’s definitely not for everyone, as some people refuse to showcase a stainless steel appliance in their home. Is there really a point to it? We’ve looked into the apparent differences, and come up with these pros and cons of stainless steel kitchen appliances. Stainless steel is manufactured, and doesn’t naturally occur. Because of this, it goes through quite a few tests in order to be as durable as it is today. That being said, they are some of the most durable products in the market, and will last for years without showing too much damage. In addition, they’re easy to find nowadays, and it’s easy to get a complete kitchen set in stainless steel. They’re almost guaranteed to all look the same because of their brushed stainless steel facades, and will look fantastic when in an entire set. Having stainless steel appliances will actually raise the value of your kitchen and home, and might help you sell your place at a better price. 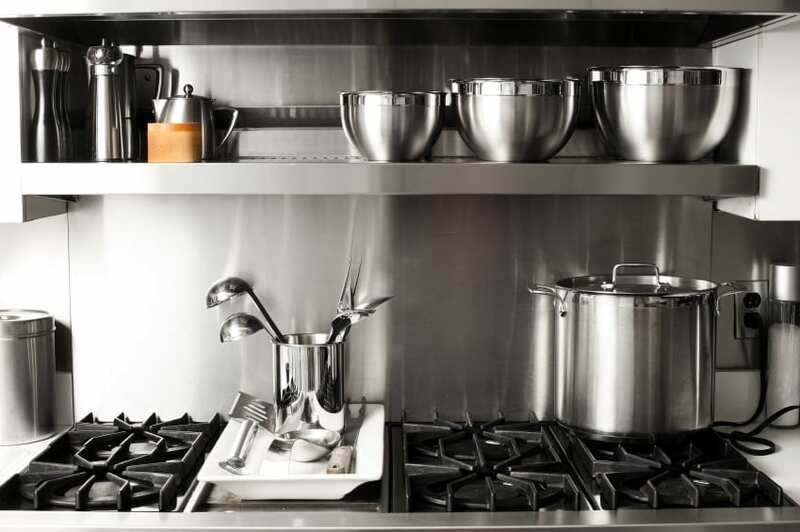 Stainless steel, while durable, isn’t anti-dust. It shows dirt, smudges, and oily fingerprints almost immediately, and can be a pain to clean up constantly. Families with small children have reported needing to clean their fridge almost daily to keep them looking decent. You also have to be careful as to whether you’re buying a magnetic appliance or not – as you might not want to purchase one only to come home and find that your magnets won’t stick. You will also have to be careful with your purchases, and make sure that everything will fit where you expect it to, and that there aren’t any hidden surprises. By far the biggest con is the cost. The average cost for a stainless steel refrigerator is around $2,000. Especially when compared to an average cost of less than half that for a different type, it’s very expensive. It can be difficult to find a way to afford a full set of kitchen appliances, as the cost grows exponentially higher with each appliance. Overall, stainless steel is a very durable and long-lasting purchase. You can expect to have your appliance going strong for years on end, without any worries about extensive damage. It doesn’t hurt that they’re stylish and modern, and won’t look outdated in a year or two. However, they will certainly cost you a pretty penny up front, and the investment might be too high for some people’s budgets. It’s a purchase that must be carefully considered, no matter who you are. We recommend stainless steel for people who want the long-term investment, and we recommend choosing something else for those who want low-maintenance. If cleaning is low on your list of things to do, then consider finding a different type of appliance that will take longer to show dirt and grime. If you’re not worried about your refrigerator lasting as long, or not worried about the resale value on your home, then stainless steel might not be worth the price! For more on Appliances, check out our features here.